Summary: Take a splash of betrayal, add a few drops of outrage, give a good shake to proper behavior and take a big sip of a cocktail called…Ladies' Night! I'm beginning to think it wouldn't be summer if I didn't read a book by Mary Kay Andrews. Ms. Andrews has quickly become one of my go-to authors for beach/pool reads. Her new novel is called LADIES' NIGHT, and I think it's safe to say that her fans will once again be happy with the result. Quite simply, LADIES' NIGHT is just a fun book that takes you away and let's you forget about life. (I told you it's perfect for a summer read!) The story begins when Grace discovers that her husband has been having an affair and subsequently freaks out. She actually ends of driving his sports car into the swimming pool! Prior to learning about her husband's infidelity, Grace seemingly has it all -- a huge house gorgeously decorated, lots of money, and a terrific job as a blogger. However, life as she knows it takes a drastic turn and she ends up living with her mom above a bar; and she loses her business, blog, house, name, etc. to her husband and his fling! As a result of Grace's freak out, she is sent to a court mandated "divorce recovery" therapy session to help her deal with her anger. There she meets some bitterly scorned women along with a guy that captures her interest. When all of the attendees start thinking that something isn't quite right with the therapist, they start having their own "therapy" meetings at Grace's mom's bar. Together, they form a unique bond and end up working through many of their problems. LADIES' NIGHT had a little something for everyone -- some revenge, some heartache, some romance, and even some mystery; and I shouldn't forget to mention that this novel also had a lot of humor! I thought the story was a hoot and I pretty much flew through it despite its 450+ pages. (Having said that, I do think it could have been a little shorter without losing anything!) I loved the characters and their interactions, and I would definitely say that the story was chock full of funny moments. One element of the story that was a little unique for me for a Mary Kay Andrews book was the mystery. It wasn't a huge aspect of the story, but I did enjoy it and found it interesting. Many of you probably know that Ms. Andrews also writes mysteries under the name Kathy Hogan Trocheck, and I thought it was cute that she kind of combined her two book styles in LADIES' NIGHT. Don't get me wrong -- I love escape books; however, LADIES' NIGHT also had a little bit of substance thrown in with all the fun. As a result, it could be picked for a book club discussion. I found this reading guide on the author's website which has seventeen interesting questions. Some of the themes you might want to explore include marriage, resentment, forgiveness, acceptance, therapy, love, betrayal, and friendship. 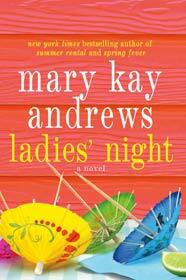 Don't let summer go by without picking up a copy of LADIES' NIGHT! This one sounds like fun! Driving the car into the pool...good for her! I'm adding this one to the TBR! Summer, the pool, and a fun book! Perfect. I'm intrigued that she threw a little mystery into this one. I've been wanting to read this ever since Andrews was here for a lunch. Her description of the book made me think it would be good so I'm glad to see you liked it! I get a big kick out of Mary Kay Andrews' books and I like her a lot as a person. This is definitely on my list! I like to read Mary Kay Andrews and Nancy Thayer in the summer, and I still have a month left so I will put this on my wishlist now. Thanks for sharing. I love her novels when I'm in the mood for a light read.